This comprehensive study of party competition in Europe since 2008 aids understanding of the recent, often dramatic, changes taking place in European politics. It addresses how the multiple crises that Europe faces have affected the intensity and structure of party competition, and whether we are seeing a wave of 'critical elections' which will reshape European politics for years to come. The geographical scope of the book covers fifteen European countries, including cases from North-Western Europe (Austria, Britain, France, Germany, Ireland, the Netherlands, and Switzerland), Southern Europe (Greece, Italy, Portugal, and Spain), and Central-Eastern Europe (Hungary, Latvia, Poland, and Romania). Using original data from a large-scale content analysis of mass media, and the debates among parties in election campaigns, this book provides clear graphical presentations of the results, appealing to a wide readership of students, scholars, journalists, practitioners, and the politically interested public. This is a comprehensive analysis of how the Great Recession has shaped the politics of Europe. Employing original data for fifteen countries, the authors provide an invaluable guide to the structure of democratic competition and the rise of a cultural cleavage over the past decade. The result is an compelling analysis that is required reading for students of Europe and democratic politics more generally. Drawing on new and extensive datasets, Hutter and Kriesi's volume highlights how the Great Recession impacted on the structure of political conflict, often serving as a catalyst of party system change, but that the impact varied (sometimes significantly) across the continent. 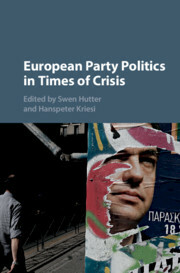 European Party Politics in Times of Crises is a landmark publication that deserves to be on the bookshelves of all scholars of party politics. This impressive volume investigates the impact of the financial crisis on the electoral and protest arenas of European countries. It stands out from similar attempts by combining meticulous analysis of media data with exceptional sensitivity to the timing of the economic crisis in relation to political developments, the strategies of political actors and the specific issues that dominated and polarised the public debates. The book documents the continuity and transformation of the political space in Europe and the increasingly divergent regional patterns. It is a must-read for anyone interested in how European parties and ordinary citizens reacted to the crisis, and how the competition between cultural, economic and political understandings of the challenges led to a new socio-political configuration on the continent.